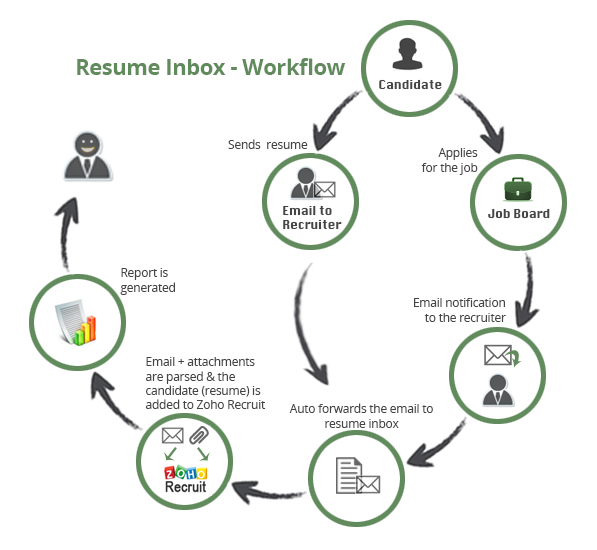 A smart and efficient work process is what we aim for and that is exactly what Resume Inbox delivers. With this user-friendly parsing tool, the recruitment procedure becomes a lot easier as it automatically parses resume from your inbox and transfers the candidate details directly to Zoho Recruit. So no more hassle over cluttered mailboxes, with a few easy steps you can configure your Resume Inbox and get started. Automatically extract resumes from multiple email accounts. Parse not only the candidate details from attachments but the entire email including the content, to, from, and subject. Save time in switching between your email client and Zoho Recruit. Extract resumes from different email clients like Zoho Mail, Outlook, Gmail, and Yahoo Mail. Parse only the required information. View parsed and failed resumes.